During WW2, the Warsaw civil population endured worst sufferings than any other European city, from the German invasion on September 1st, 1939 till the Allies victory in May 1945. The Nazi committed permanent atrocities in the Jewish Ghetto in 1942-1943, leading to the extermination of about 450.000 people. Thereafter, the whole city was nearly completely destroyed following the missed Uprising triggered by the Resistance / Home Army in August 1944. This proved unsuccessful chiefly because Stalin opposed to any support despite the proximity of the Soviet army on the eastern bank of the Vistula, and even denied permission to land in nearby Soviet-controlled airfields to supporting RAF aircraft. The Yalta Conference did not restore their independence to the Poles despite their brave behaviour during WW2, and the following decade was a long dark period of privation and purges. These targeted any individual that could possibly contribute to the restoration of the Polish identity, be it war heroes, members of the cultural elite, famous artists or Olympic champions. Those with a special interest on these dramatic events should read the book "Rising'44, the battle for Warsaw", by Norman Davies (2004), which was acclaimed both in Poland and internationally as a major exhaustive reference. See also http://www.warsawrising.eu for a first class "primer" on the subject. RAF Liberator 1:1 replica: Beside the Ghetto Museum, The Warsaw Uprising Museum is another "must" for any visitor to Warsaw. Its major artefact is a nearly complete 1:1 replica of a RAF Consolidated Liberator B MK 6. The real aircraft, S/N KG890 (MSN 44-10395), took part to a resupply raid from Brindisi for supply (mainly weapons and ammunition to the Warsaw Resistance. Manned by Polish crew of the 1586 (Polish) Squadron of the RAF, it was lost during its return trip. Despite this dramatic background, nowadays Warsaw, totally reconstructed, is a very pleasant destination for city trips, with a charming Old Town, Royal Palace and pleasant gardens, full of cultural events, all types of food and good beers. 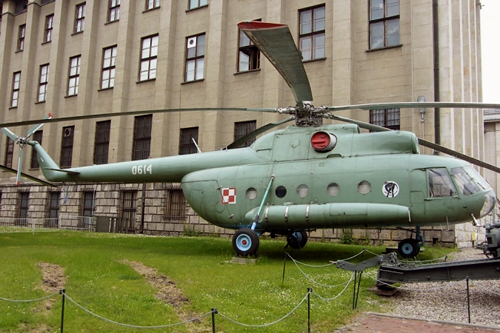 The subject of today, the Polish Military Museum covers this scope "all-round". Inside the large Stalinian building shared with the National (Art) Museum, an enormous amount of historical military artefacts are displayed covering several centuries. However, when it comes to aviation, this is either the single or even the best place for aircraft buffs - the specific Polish Aviation Museum is in fact located in Cracow-Rakovice-Czyzyni. There is also another depot of preserved aircraft at Fort Czerniakowski, in the suburbs of Warsaw. The exact location of Muzeum Wojska Polkskiego is Aleje Jerozolinskie, N°3, Warsaw. A good point is that it lays within reasonable distance from the center, walking down the Nowy Swiat, one of the most pleasant Warsaw streets for shops along the University, and down to the famous palmtree in the middle of Jerozolinskie Boulevard. All Museum's aircraft bear the correct red-white checkerboard, dating from Dec. 1st, 1918 and reinstalled by Gen. Polynin on July 11 1945 (during WW2, red stars had been imposed to the Soviet-controlled People's Polish Air Force). The pictures are presented hereafter in more or less the order of visit from the main entrance gate to the rear part of the gardens. Aircraft are all displayed outside, which renders them vulnerable to the rigorous winter conditions of Poland. However, restoration activities are obviously ongoing , unfortunately hampered by lack of sufficient budget and workforce, as too often seen elsewhere in Europe. TS-8 Bies piston: training aircraft . "Bies" is an oldish Polish word for "devil". The TS-8 was designed by Dr.Tadeusz So?tyka (hence TS) at the institute of Aviation in Warsaw. It was the first plane designed post-WW2 in Poland, fitted with a Polish engine, and to be serial-produced. First flown in 1955, it took another 3 years to launch production at the WSK Mielec plant, which delivered about 250 aircraft. Becoming obsolescent in the mid-sixties, it was progressively replaced by the TS-11 Iskra jet trainer, a few copies remaining in service well into the seventies. TS-11 Iskra jet trainer: Iskra means spark in Polish. Designed by the same team led by Dr.So?tyka, the TS-11 is another example of the "all-jet" training syllabus also "en vogue" in Western Air Forces at the time . First flown in February 1960, its production started in 1964 the WSK Mielec factory for the Polish Air Forces. The aircraft gained several export successes, a.o. in 1975 with an order from India for 50 aircraft. Serial production went on till 1987, all variants making up a total of 424 planes. The aircraft exhibited (code N° 101), the first model to serial production standards, served in the OTS of the Polish Air Force in Deblin, and in the 60th Flight Training Regiment in Radom. PZL-130TC-1 Turbo Orlik: Orlik means Eaglet. Still operational today and in line with the current trend of western trainers (Tucano, PC-9, PC-21..) turboprop-powered, here, Walter M-601 common to LET-410) and displaying "jet-like" flight characteristics. Developed by PZL Warszawa - Ok?cie, the Orlik first flew in 1984 initially equipped with a piston radial engine (abandoned in 1990). As a result of further upgrades the TC-1 model was equipped with Martin Baker MK. 11 ejection seats and state-of-the-art avionics. About 35 Orlik aircraft are in use today, the Museum copy, reg "018", C/N 02930018 being an ex-service aircraft, to full production standards. MIG-21 PF Fishbed: The MIG-21 lightweight interceptor fighters were initially designed for the clear weather air superiority role, latter versions gaining more and more all-weather and multi-role capabilities . From 1966 onwards , the Mig-21 became the baseline fighter aircraft equipping the Polish Air Force. The displayed aircraft served through the early 1990s in the 1st "Warszawa" Air Force Fighter Regiment. Equipped with RP-21 saphire radar, it benefited from an extended range and was armed with missiles only. The Polish Air Force got a total of 505 Mig-21 of all one seat types, plus 77 two seat trainers. MiG-29G (9-12A) Fulcrum: This particular aircraft, reg. 4111, C/N 2960525111was received on June 7, 2005. From a batch acquired from the Luftwaffe (ex 29+04), it had previously seen service with the East German Air Force under "628". It was operated by the 41 Tactical Air Squadron, Malbork (known as 41.ELT - 41 Eskadra Lotnictwa Taktycznego in Poland). Sukhoi SU-22 M4: This aircraft reg. 8512 - MSN 28512 - carries a very similar "flame" decoration to reg. 8919, which performed in the Florennes Airshow in June 2010, in a combine display with Reg. 3819 (standard camo). Same "8elt" logo is present on the vertical fin. Yak 40 VIP Governmental: Reg. 044 - MSN 9840659. This aircraft was operated by the 36th Air Transport Regiment , based in Warsaw. Inscriptions are in Polish on the port side, and in English on the starboard side. It seems that efforts are done to preserve the interior, which may be open to visits in selected occasions. Antonov An-26 "Curl": Reg. "1602" Famous for its ruggedness and versatility, one of the most common medium transport used in the former "Warsaw Pact" and other countries in the Soviet area of influence. PZL - Mielec I-22 Iryda M-96 SP-PWG MSN 1AN002-04: Designed as a jet trainer to replace the TS-11 Iskra in Polish Air Force, the I-22 displays a striking resemblance with the Alpha Jet, although with much less wing sweep. The project, launched in the late seventies, suffered from excessive development delays. First flown in 1985 with indigenous engines, re-engined twice finally with RR Viper 545, the I-22 was briefly used by the 58the training Regiment, but was grounded in 1996 after only 17 were built. The initial design was plagued with excessive landing speed (185 Km/H) and landing distance (1500m). The M-96 version was a desperate attempt to correct these deficiencies by adaptation of leading edge slats, Fowler trailing edge flaps and LERX (Leading Edge Root Extensions), which this "0204" features (at considerable expense to back-seat accessibility) . Considering the importance of the program for the PZL Mielec company, it was not until January 2002 that the program was finally canceled. Mil MI-24D Hind Reg 013/ MSN A1013 - Mil MI-8 Hip Reg. 0614 / MSN 10614 - MiL (PZL-Swidnik) MI-2P Hoplite Reg 1449 / MSN 531449040 - From large to small, a selection of very common helicopters in use in the former Warsaw Pact Air Forces. Surface-Surface Missiles: SCUD-A (NATO code SS1B) , Launch Vehicle 8u218 carrying R11 missile and SCUD-B (NATO code : SS1C), Wheeled Launch Vehicle MAZ-543 with tactical ballistic missile R-17 Elbrus. Surface- Air missile (V-750 , S-75 Dvina system, SAM-2 NATO code). Displayed along a vast collection of tanks and armored cars, this is the type of missile which downed the U-2 of Gary Powers in a CIA flight over Russia on May 1st, 1960. Ilyushin Il-10 / AviaB-33: Reg 011/ MSN B33-5523. Red white nose, cockpit area restored (freshly repainted). The Il -10 was a post-war, improved version of the famous Il-2 Sturmovik. The present aircraft is probably a B-33 licence-built by AVIA in Czechoslovaquia. The first one flew on Dec. 26, 1951. In total, 1200 B-33 and CB-33 (trainer variant) were built until 1956, but total Il-10 production, all sources included, reached 6166. Polish Air Force used 120 Il-10 and 281 B-33, all withdrawn by 1961. Ilyushin Il-2M3 Sturmovik: Reg. "21" (Yellow Nose). 200+ of these aircraft were used by the Polish Air Force from 1944 to 1949. Along with the Polish People's Army (Ludowe Wojsko Polskie) in the USSR, the Ludowe Lotnictwo Polskie - Polish People's Air Force - was created, in defence of the Soviet Union against Nazi invasion. In late 1943, the 1st Fighter Regiment "Warszawa", (equipped with Yak-1 and Yak-9 aircraft), the 2nd Night Bomber Regiment "Kraków" (flying Polikarpov Po-2 aircraft - produced in Poland as the CSS-13 from 1949 onwards), and the 3rd Assault Regiment (flying Ilyushin Il-2 aircraft) were formed. During 1944-5, further regiments were created, coming together to form the 1st Mixed Air Corps, consisting of a bomber division, an assault division, a fighter division and a mixed division. After the war, these returned to Poland and gave birth to the air force of the People's Republic of Poland. Yakovlev Yak-9P: Reg. "23" MSN 10107 - Red nose. Immediately after WW2, the new Polish Air Force reequipped with Yak 9s. It operated 123 Yak-9P till 1953, the "P" variant, the most common Polish standard, representing the epitome of this famous fighter, before emergence of the Jet era. Construction was entirely metallic, including ailerons. In addition to improved pilot protection (armoured seat, bullet-proof windshield), the Soviet authorities insisted that it was build to "peacetime" rather than "wartime" tolerances and quality, for increased longevity. In total, 297 Yak 9 were operated by Poland, all versions included (Yak- 9, -9M, -9T, -9W, -9U, -9P). Baseline engine was the 12 cyl Klimov VK-107developed to match the DB605 of the Bf-109G which proved troublesome (life expectancy: 25 hours only) and cumbersome (25 manual cycles of oil pumping mandatory for adequate lubrication before start, unlike its German or allies counterparts, equipped with forced closed cycle lubrication). Tupolev TU-2S: Reg "8" , post-war model, powered by two 14 cyl Shvetsov ASh-82 IR engines, rated at 2100 HP, with 4 blades AV-9VF-21F propellers with square tips. The large glazing under nose was not for accommodation of a bomb aimer, but for better pilot visibility during take-off and landing.. Eight aircraft only were operated by the Poles, from 1945 to 1960 (including some Utu-2 target tugs).